Help to Buy Scheme Approved. MKN Property Group is proud to present the final phase in their award winning Ridgewood development. This new phase is called Ashfield and comprises of 173 new 2,3,4 and 5 bedroom houses ranging in size from 90 m2-148 m2 (970 sq ft-1,595 sq ft). The houses at Ashfield benefit from an “A” BER rating and incorporate contemporary interiors with a high quality craftsmanship and an attention to detail which is synonymous with the MKN Property Group brand. Ashfield is located beside 14 acres of amenity space laid out as seven GAA/soccer playing pitches with associated changing facilities which serve the entire Ridgewood development. The overall Ridgewood estate is a mature, well maintained development with extensive open spaces, two children’s playgrounds, playing pitches and neighbourhood facilities comprising of a Tesco Express Store, McCabe’s Pharmacy, Medical Centre and Tigers Childcare. 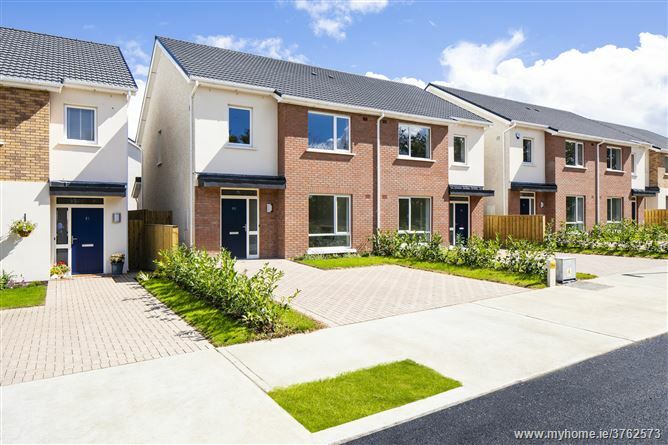 Ridgewood is ideally located between Swords Village and Forest Little Golf Club with easy access to the M1 and M50 motorways, Dublin Airport and Dublin City. Continue to the top of this road and turn right into Ashfield. Ashfield - Ridgewood, Swords, County Dublin.